Cast: Brad Pitt, George Clooney, John Malkovich, Frances McDormand, Tilda Swinton, JK Simmons. Written and directed by the Coen brothers Joel and Ethan. Story: Stupid people try blackmail. Ooooo, I was looking forward to this one. If you like the Coen brothers, you'll love this one. 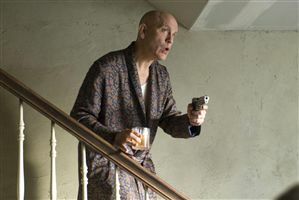 A high expectation can often curse a movie - many's the time a sure-fire hit has turned into a mild disappointment (Shrek 3, for one) - and twenty minutes into Burn After Reading I was rather regretting the high recommendation I'd made to my moviegoing posse. Although the Coens are possibly the world's best at character development, it isn't the most fascinating opening reel I've ever seen. Once the train has moved out of the station, however, we're treated to the typically deft story-handling that defines all of the Coens best, from O Brother, Where Art Thou? to last year's Oscar winner No Country for Old Men. Brad Pitt is brilliant as the dimwitted fitness instructor, transforming every scene he touches, while George Clooney, Frances McDormand and Tilda Swinton are all highly watchable in their various eccentric niches. The star quality really helps - although this isn't one of Clooney's finest performances, he still commands the screen in a way that would elude any unnamed actor, no matter how talented. And the CIA guys, well they're just hilarious. My only caveat would be that you really do have to watch it to get the most out of it - if you like to let movies wash over you then you won't get it at all. If you liked Fargo, then this will be right up your vegetable garden. Burn After Reading is rare on two counts. One - that it can survive a high expectation. Two - that it left me wanting more, thanks to the rather sudden and unexpected ending. One of the movie highlights of the year. To enjoy this film you should: appreciate the Coens' quirkier back catalogue, such as O Brother, Where Art Thou?, The Big Lebowski and Fargo. 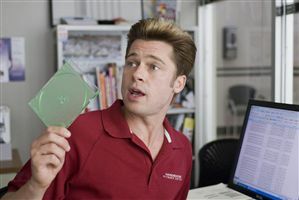 Burn After Reading was released in the UK on 17th October 2008.